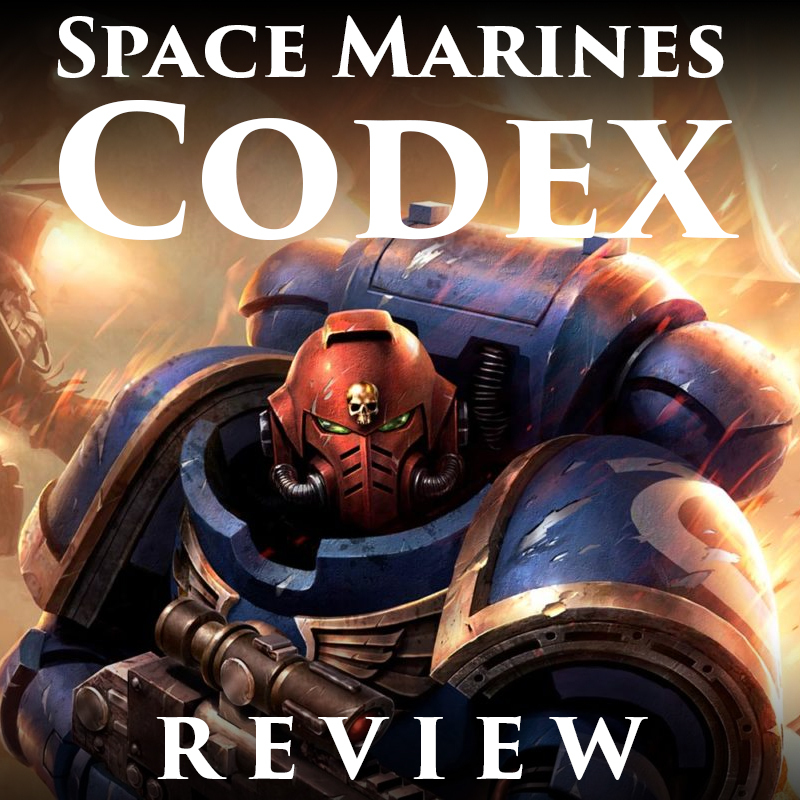 There's a new edition of Warhammer 40,000, and that of course means a new Space Marine Codex to coincide with it. This version packs much more of a wallop though with the advancing storyline and the brand new Primaris Marines. So what does the newest tome for the Adpetus Astrates hold? First things first, I really like this new cover artwork! I think it blows the past two out of the water, although I did like the 7th edition cover as well. The new Primaris Marine drawn in this iconic style just looks awesome, and the colors used really frame it well. Beyond the art itself, I really like the new layout and design they are doing for the 8th Edition covers with the border. It looks very clean and professional. When you crack it open you're greeted with the start of all of the lore, stretching back to the Great Crusade. There's a lot of familiar ground covered here for anyone already familiar with Space Marines and 40k, but most of it is presented in a new way. It didn't feel like I was re-reading something just copy pasted from an older edition. The Heresy section, for example, felt like it drew a lot more influence from the ongoing novel series, helping cement the game and the fiction together more. There are also some beautiful layouts in this section, including the one above, and a bunch of interesting side boxes. There is, of course, plenty of new lore in here too, dealing with the advancing timeline. I'm really liking the direction they're going with the setting and the Primaris Marines, so anything I can read on them makes me happy. There's a bit about the creation of a Space Marine that lists out all of the organs that go into their creation, plus three new ones for the Primaris. Stuff like this fascinates me. We also get to read about Guilliman's Indomitus Crusade and the war in Ultramar, including the Plague Wars. After this it goes into each of the main Space Marine chapters in depth, starting with the Ultramarines. Each section covers the whole history of the Chapter, starting with the founding of the legions in the Great Crusade, the reunion with their Primarch, the Heresy, a couple of major engagements since then, and where they are at currently in the lore with the new storyline. I feel like this is the most in depth they have gone outside of the mini Codexes that focused on just one Chapter. You get a real sense of what they're about plus their history. They've included some color templates of a few of their successor Chapters too, with a little bit of background on each. Some of these will be very familiar, while others are a bit more obscure. Some, like the Scythes of the Emperor, are now in the spotlight because previously they had been near depleted in strength, and are now back up to full strength thanks to the Ultima Founding, which is the introduction of the Primaris Marines. I think the artwork for the color templates are the nicest ones they've had in awhile too. They are miles ahead of what they had in the 7th edition Codex, and while not quite as good as Forge World's, they are pretty close. A huge improvement in my opinion. The Chapters that are covered are the first founding Chapters; the Ultramarines, Imperial Fists, Salamanders, White Scars, Raven Guard, and Iron Hands, as well as a few of their successor Chapters. The Crimson Fists and Black Templars, while not first founding Chapters, also get a full a spotlight on them due to their significance. I've always liked these two, so it's nice to see them continuing their time at the top of the Space Marine hierarchy. They have both been on the covers of 40k rulebooks and starter sets after all. The artwork in the Codex is stellar throughout. There are a bunch of returning pieces from past books, but also a bunch of new stuff. This two page spread of the Death Guard vs the Ultramarines continues to impress me even though I already saw it in the main rulebook. Everything new in here pretty much deals with the Primaris Marines, which is fine with me. Next it goes into more detailed background descriptions of each unit. These are grouped into a few sections; Commanders, Battleline Squads, Close Support Squads, Elite Squads, and Fire Support Squads. Each unit gets at least a few paragraphs about it. Again, even though I had read about some of the older units before, the information in here felt fresh and like they had taken the time to rewrite it instead of just copying it. All of the new Primaris stuff drew my attention the most, with all of those new units being covered. The Special Characters sections finishes it off. Most interesting to me are the continuation of some of these character's stories from where we last saw them. Shrike is now the Raven Guard's Chapter Master after the Damocles events, Sicarius is lost in the Warp, and Pedro Kantor has been given a new lease on the life of his Chapter with the Ultima Founding. Not every character has their story updated in this way, but enough do that it felt new to me. Kantor's story in particular stood out to me for interacting with the current storyline in 40k the most out of all of them. No Codex would be complete without the 'Eavy Metal gallery, showing off all of the studio's models. The Ultramarines get to show off all of the new toys, but the other Chapters that were covered in the book also get a page at the least. I wish all of these had Primaris Marine examples painted up just so I could see what they looked like in each Chapter's scheme. Some of them did, but not all of them. In fact, it would have been really cool to just have a quick gallery of a Primaris example of each Chapter and successor Chapter shown off earlier, kind of like what they did in the old 3rd edition Marine Codex. Just so you have a painted example to go along with the color template. This section is rounded off with an example army collection built off of the Know No Fear starter set. Hobby sections like this always interest me, and if the book had any page count to spare it would have been cool to see another example collection or two, as it is the Codex is already pretty lengthy. Now we finally get to the rules, the Dataslates for each unit. You know that the Space Marine model range is extensive, but it's not until you see how many Dataslates they have that you really appreciate it. There are 85 different unit entries in here, taking up a total of 54 pages of the entire 208 page book! That's a lot of choices for your army. These are all structured the same way they were in the Indexes. There's a list of different weapon options at the front, such as Melee Weapons or Terminator Melee Weapons, and each unit entry says what options it can take. It will either list them on the Dataslate right there, or say they can pick one from one of the categories at the front. The power level for each unit is also on the Dataslate as well as the power level cost for any increase in unit size. Some of the units that were in the Imperium Index 1 didn't make the transfer over here, like the Anniversary Marine model, or the Command Tanks from Warhammer World. I assume that's because those models are much more niche and limited in stock. You can still use the rules for those from the Index though I would assume. The Heresy era stuff did make it in though, with the Cataphracti and Tartaros pattern Terminator squads both in here. Most of the pages have two Dataslates on it, but some are so large that they take up a whole page on their own, or have some cool photography like this inserted in to accompany it. The model photography in here is just as good as we have come to expect too. This battlefield shot in particular really captured my attention. After all of the unit rules we get some of the army wide rules. Each Chapter has it's own Chapter Trait that applies to the units in the army. These all felt very suitable to the Chapter they were representing without being overpowered. If you're playing a successor Chapter just use the trait from your parent Chapter, unless you're the Black Templars, who got their own. There are also a whole score of new Stratagems for you to use your Command Points on. There are generic ones that any Space Marine army can use, and then also a unique one for each Chapter that has a trait. Some of these Stratagems seem like they are trying to replicate the abilities from some of the Formations that were lost in the transition from 7th edition. For example, there is one in here for using three Predators together, as well as one for using three Vindicators. There are also a bunch of Warlord traits, again with a unique one for each major Chapter. The Librarians get some more love too with an expanded selection of psychic powers to choose from. There are now six powers they can pick besides just the three that were in the Index. The whole Codex wraps up with the stats on every weapon in the army, shooting and melee, and the points values for everything. All of the units points come without the cost of their weapons built in, so remember to add those points in when making your army. The only models that have the cost of their weapons factored in already are the special characters. It's still a little odd having this at the rear of the book since there are so many weapon options to factor in, but I'm sure it's something that I just need to get used to, or I can just play power levels. This is probably my favorite Space Marine Codex since the 4th edition one. There is so much awesome content in here, and we're finally heading into uncharted waters with the backstory. The production value on this is super high too, easily beating the 7th edition codex in terms of presentation. As the first full codex for 8th edition I would say this is a home run. Everything in this was done fantastically, and I'm really excited about the direction of the game. As I write this the Chaos Space Marine and Grey Knights Codexes are already up for pre-order with seven more slated for release before the end of the year, so we'll quickly see if they all live up to this quality. I have a hunch that they will. If you play Space Marines this is obviously a must buy, but it's also not a bad purchase for anyone who is a fan of the 40k game. Space Marines are the main army of the setting after all.